Borgenicht, David. 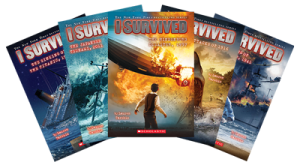 The Worst-Case Scenario Survive-o-pedia. Claybourne, Anna. 100 Most Dangerous Things on the Planet. George, Jean Craighead. My Side of the Mountain. Hale, Nathan. Big Bad Ironclad! Hanel, Rachael. Can You Survive and Earthquake. Jenner, Caryn. In the Shadow of the Volcano. Kennedy, Marlane. “Disaster Strikes” series. Monninger, Joseph. “Stay Alive” series. O’Keefe, Emily. Joplin Tornado Survival Stories. Ruckman, Ivy. Night of the Twisters. Russo, Kristin J. Survival Facts or Fibs. Smith, Roland. “Storm Runners” series. Spradlin, Michael P. “Killer Species” series. Turner, Tracey. “Lost: Can You Survive?” series. Zimmerman, Dwight Jon. The Day the World Exploded. Zullo, Allan. Heroes of Hurricane Katrina.